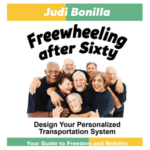 Aging expert and author Judi Bonilla asks us to focus and reframe our thoughts about giving up the car keys. Instead, she asks us to make giving up the car keys easier. In Freewheeling After Sixty learn how to design a personalized transportation system. A system that reflects the needs and resources of an elderly driver. This is the perfect book for anyone who answers yes to these questions. • Are you avoiding driving at night? • Are you decreasing how far you drive? • Are you limiting when you drive? You have decades of experience behind the wheel. Now use Freewheeling to develop a Personalized Transportation System to meet your needs.